I’m almost never late. I say almost solely because I’m almost always late to my studies, and almost never to meet pals (it boils down to a matter of how much I actually want to be there.) But here I am, very late to a metaphorical train which departed a week (or two?) ago and is now in Milan. Yes, fashion week, if it wasn’t evident by the title. I’ve been slowly stirring my opinions about NYFW to a boiling point, and voila, a stew of my highlights, served to an un-amused you. I’ll open with Opening Ceremony (you’ve already clicked away, disgusted with idiotic puns, but I proceed anyway.) Unique ways to showcase clothes seem to be taking over, as fashion departs from the realm of serious and dips into a more spectacle-like event. And that’s great; we love our look telling a story. Opening Ceremony boldly went and surprised everyone when after taking a most graceful and perfectly staged fall; models spiraled into a dancing sequence down the catwalk, revealing that the majority amongst those who walked was from the New York City Ballet. Other then the show, the clothes showed were exquisitely business casual in a way only fashion-business can be. Fringed skirts, knee-grazing dresses and an occasional silk pant dressed the models for a balmy yet hectic (as New York is) spring-to-come. My favor fell to the silk, long, fringed red and white t-shirt-dress-thing. Rag & Bone kept to its urban doctrine. The clothes catered particularly to the cool girl, to the I-don’t-dress-for-boys girl (which, mind you, all of us should be that kind of girl.) Slip dresses reaching past the knee were paired with sneakers and heavy jackets obscured any possible outline of the torso. There was a very fetching navy playsuit too. Lots of white, black and navy blue, which works well with the colour spectrum of my own wardrobe. Again, wide pants were heavily featured, as well as what I consider to be trademark Rag & Bone bomber jackets. 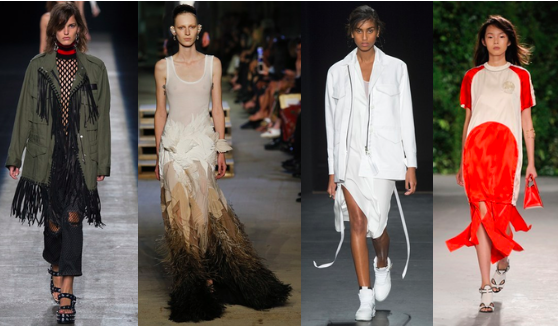 I greatly fancied the all-white fringed dress (see a pattern yet?) with white sneakers and an oversized white jacket ensemble. Don’t you just want to go to work wearing your pajamas, and yet, not lose your intimidating demeanor? This isn’t an ad or anything, but if yes, then here’s Givenchy. Breath-robbing was the gown flowing from a semi-transparent sleeveless shirt into a sweeping, feather-garnished white skirt gradually darkening to mossy, mud-brown to deep, coffee colour, as if the bride has walked quite the walk to get to chapel. Diane Von Furstenberg broke the monochromic chain with pinks and patterns. There were silk playsuits, fifty’s silhouettes and high-waisted everything. I have to say, colour mesh doesn’t entertain my eye much, but it did warm that small part in me which awaits the next time I can vacation somewhere sunny. Wind forward to the utilitarian navy and khaki and black. This is Alexander Wang. Everything about the cut of cloth I love and respect, because the more work settles to reside permanently on my desk (its currently a small tower,) the more I break my head over said desk in attempts to dress both cool and comfy. It’s all I ever think about now a days. Cool and comfy. And… I’m done. What’s more to add? Go purchase some white sneakers, high-waisted pants and a slouchy coat. Leave.